Fashion is serious business, folks. 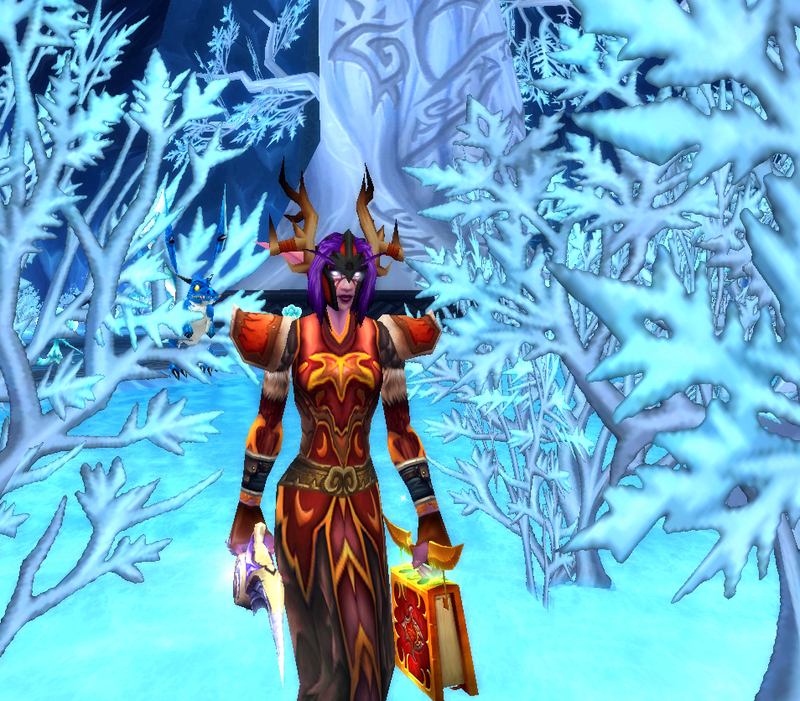 In both Azeroth and meatspace, what we wear reflects how we conceptualize ourselves. To me, mogging falls under the umbrella of the “digital folk traditions” I’ve written about a little over at Flavor Text, because it represents an avenue that gives players more agency to express how they relate to the game world. 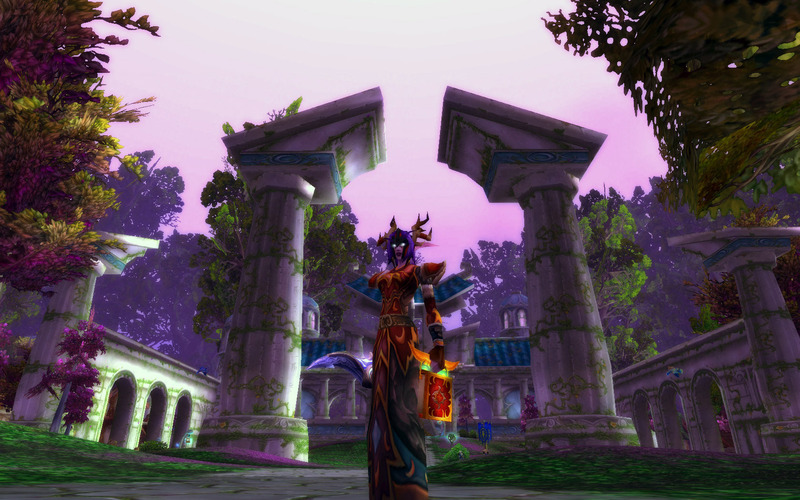 One need only look at transmog’s popularity to see just how badly we needed a little more flexibility in this sandbox to shape our digital identities. Many of my alt characters have silly or fun backstories (such as Fabulor’s BFF, Drabulor), but Catulla, my main, is the character I consider to be the most direct extension and representation of myself in this internet dragon social network. As such, I’ve put a lot of time and energy into trying to develop a look that I feel encapsulates her personality and a little bit of her history. Cat’s story has been a constant work in progress over the past few years, and many of the concepts I’ve thought about in terms of her character and how she views modern kaldorei society (she’s a pre-Sundering night elf) have been pretty influential on other projects I’ve worked on. I call her my “magedruid,” as she spent most of her youth in pre-Sundering Eldre’Thalas under the tutelage of the Shen’dralar. Her training was cut short by both the events leading up to the War of the Ancients as well as her own inner fears over whether the path of the mage was truly the one she was meant to follow; after seeing so many of her mentors fall prey to the machinations of the Legion through their use of magic, she doubted whether or not she had the capacity and skill to avoid a similar fate. 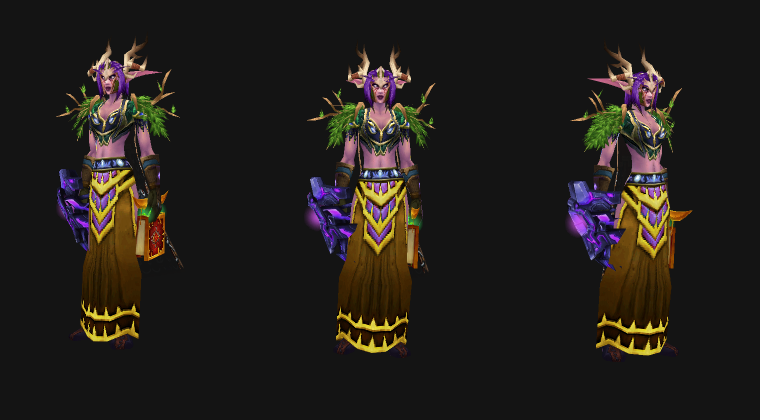 Armed with only a theoretical understanding of the arcane and a desire to heal the scars that had ravaged her homeland, she found her current calling as a balance/caster druid. She believes arcane magic to be as integral to the fabric of reality as that of nature — they are two sides of the same coin, and to her it would be unwise to discount one in favor (or in fear of) another. Some kaldorei see her as progressive, others as a heretic, but she doesn’t really give a damn. As Cyn mentioned last week, there’s a lot of room for interpretation (and disagreement) within the various druidic orders. I imagine her as being quite interested in things like the phenomenon alluded to in Quickening or Ancients of the Arcane like Arcosin, as they hint at unexamined connections between the two schools of magic that others might dismiss out of hand. Her duty as a druid is to steward the land, and she firmly believes doing an effective job of that requires researching obscure treatises on ley lines as much as it does meditation in the Dream. Transmog is like a writing prompt in a way; tell the story of your character to the world using a dozen slots, give or take. The problem for me was that it would have been far easier to get that job done if Cat had been able to equip cloth in addition to leather, and so my speedbumps were similar to those that Perculia encountered when I was designing my mog outfit. Many of the clothie sets (such as the Magister’s Regalia or the Black Mageweave Regalia) have a trademark “mage silhouette” which is difficult to re-create using leather models; however, I felt it was essential to do so in order to accurately convey Cat’s nature as a bookish mage-sympathizing druid. This list of items was the product of a few revisions. Narci, my stalwart and patient editor, once astutely pointed out to me that “Cat, your outfits, like your writing, come perilously close to not working.” That’s the thing about mogging, though — you have to experiment a little to get it right, and sometimes part of what you’re doing needs to fall completely flat on its face before you can see which of the other parts are worth keeping. Below is one of the earliest iterations of Cat’s look, based loosely around the concept of “Shen’dralar Archaelogist Field Gear”. The Luminary Kilt shares the same model with the skirt of the Highborne Robes, and my initial tack when transmog was announced was to try and re-create that appearance in leather. It didn’t really work out so well. 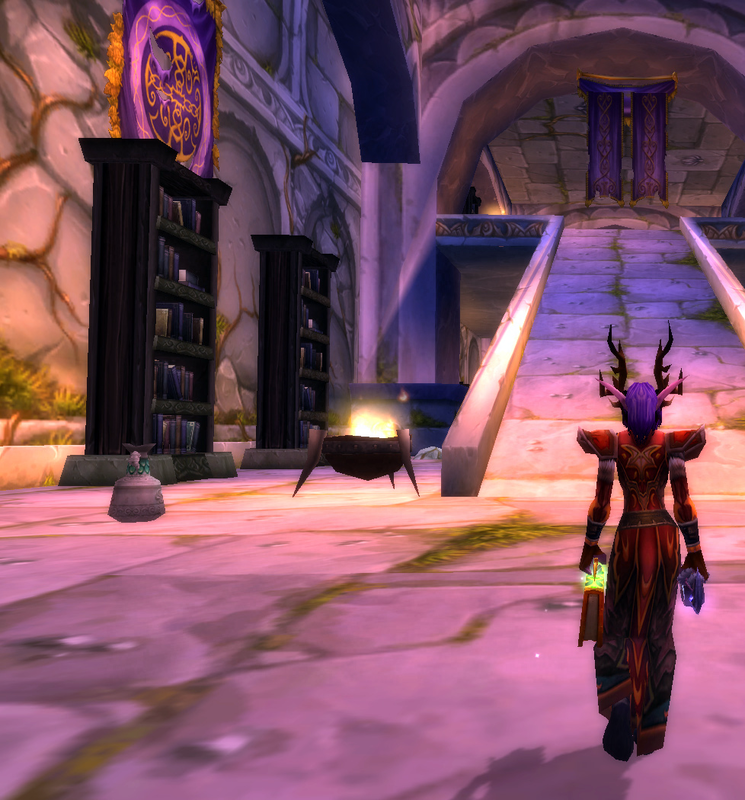 I realized that I didn’t need multiple overtly “druid” pieces; the antlers alone are iconic enough to convey “druid”. It also helped to remember that less really is more in some slots; I chose very basic gloves that are more of a filler than anything special, because I needed to let the key pieces like the Robes really sing to make this work. Using something more complicated would have added bulk and distraction that I didn’t want to the sleeves. The Robes themselves are central to the outfit and really sum up what I was trying to achieve. 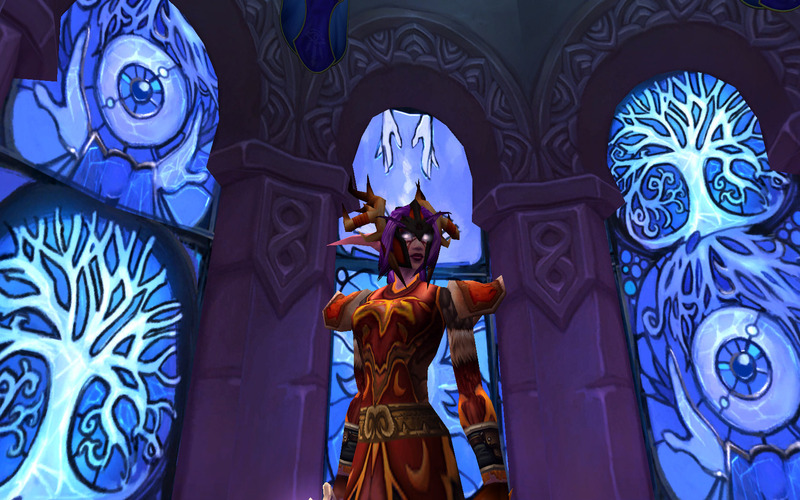 They share a model with the Stormrage Chestguard from the tier 2 druid set, but uses the vibrant reds, purples and yellows of the Magister’s Regalia to create a really striking look. Perfect. I’m really happy with how this mainhand/offhand combo turned out. The purple dagger accents Cat’s hair quite well, and stands out nicely against the warmer tones used elsewhere in the other pieces. The dagger has several quintessentially night elven elements (it’s purple, for one, and the moon has a faint pulsing glow) as opposed to the Hymnal which is far more sin’dorei in appearance. I think this contrast is important to note; Cat is literally holding the history of the elves of Azeroth in her hands, and those who forget history are doomed to repeat it. Having lived through both the Sundering and the Cataclysm, that’s not a mistake she’s keen to make, and so she arms herself with knowledge as well as pointy glowing things. I can’t really think of much I’d change about the look right now, other than possibly swapping the gloves with a darker toned version of the same model, maybe explore some other belts or wrists. That’s it. It’s funny, the amount of thought I put into this, into trying to make sense of the relationship between Cat’s identity and my own. I’m just like her, trying to understand where and how these two different sides of me marry up. Maybe that’s an exercise in futility; the longer I play, the more I realize how arbitrary the divide between them actually is. I mean, I’ve never really considered myself an RPer in the traditional sense. No more than I ever have in the real world, anyway. I love this outfit, and this post. Not only are the screenshots well framed (seriously, jiminy, great shots) but the outfit really carrys the sense of identity you are so obviously imparting onto Catulla. Wow. Just wow. I’m in awe of your outfit as well as how much thought you put into it. Your post was so well written, too; it really worked to bring me along on the path to making this look. “Transmog is like a writing prompt in a way; tell the story of your character to the world using a dozen slots, give or take.” This has really inspired me to spend some time this weekend writing up background info for my toons. I’m not on an RP server, and I’ve always had a vague idea of who they are, but putting it down on paper would definitely help in building transmog looks for them (especially my DK, who tends to shift wildly between dark DK looks and big, bold paladin looks). @Cynwise: Thank you so much for the compliment! I do think that I should go back to the whole Azerothian Photographer hobby sometime (http://flavortextlore.tumblr.com/post/18565808720); I was one class short of a photo minor in college. It’s good to know someone out there thinks I’ve still got “the eye”. 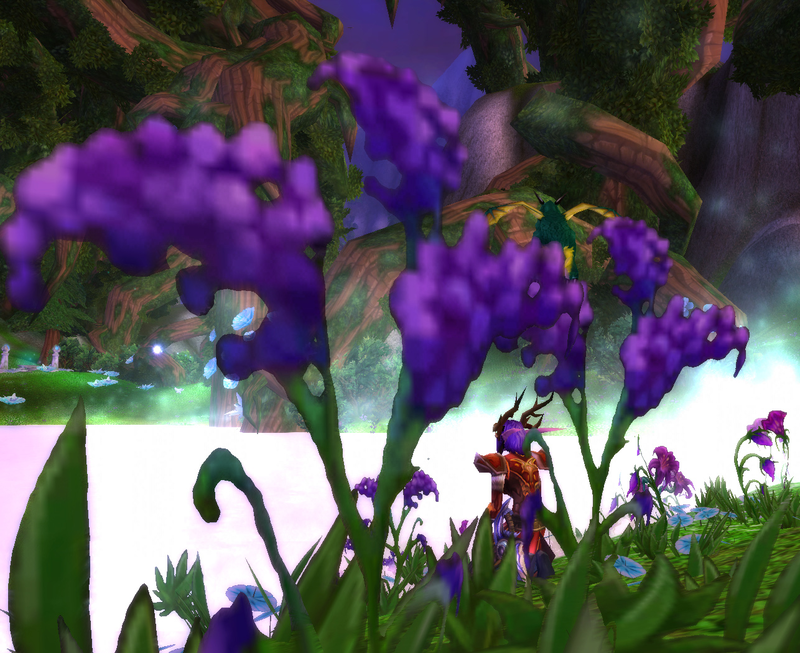 I love your concept of a “magedruid”, and the Robes of Summer Flame are indeed absolutely perfect for it! The idea that she is literally carrying the history of the Elves in her hands is brilliant, too. This has to be one of the most elegant descriptions of how Transmogrification intersects with RP, even (and perhaps especially) for people who don’t think they RP, I’ve ever read. It is true that one of the reasons why my Shaman is in T12 just because I like it a lot is that I haven’t taken the time yet to think about how to express her sense of self and self-history in her clothing.